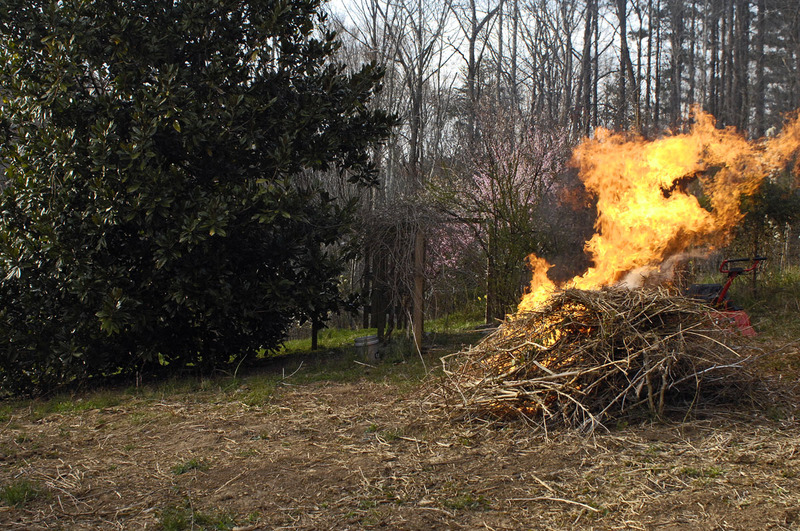 The first garden chore of the year is to clear, and then to burn, last year’s dead weeds. That got done today. The next garden chore of the year is the first tilling. That will get done tomorrow, ahead of a light rain that is due to start about 5 p.m.
After that, the next garden chore of the year will be to till again and to plant onions and cabbages. That will be done by Friday, ahead of a rainy spell that is now in the forecast. Some people plant by the astrological calendar. Good luck to them. I plant with the weather. I want to get my onion sets and cabbage plants in just before the next rainy spell. 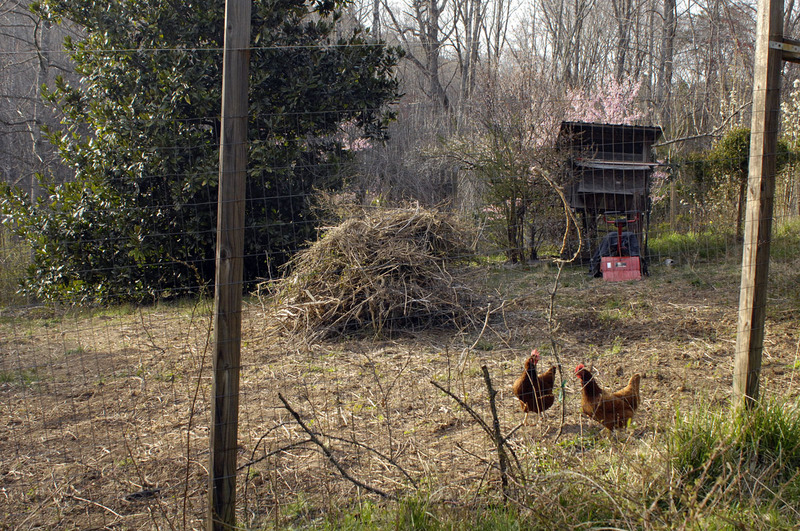 The chickens, having worked the garden all winter, will be allowed into the garden until planting begins. After that, the garden gate will be closed, and they’ll be banned to the woods and orchard (which is more than enough pasture for them). They love to pick through the garden, though, looking for worms and grubs. There are plenty of worms, and they’re welcome to the grubs. A useless detail: My Apple watch tapped me six times today while I was hacking at blackberry briars with a hoe. It asked me if I had fallen. It worries too much. Its fall detector seems to be particularly sensitive to any kind of vigorous flailing of the arms. This was written by daltoni. Posted on Sunday, March 24, 2019, at 7:16 pm. Filed under Food, Sustainable living, The land. Bookmark the permalink. Follow comments here with the RSS feed. Trackbacks are closed, but you can post a comment. You are way ahead of me. I am clearing out the bed of hostas. Some will need dividing. The deer have not bothered them since I planted monkey grass (lirope) in front of the bed, which backs up to the house foundation. Love this time of the year. 2. The Watch is watching – how creepy sometimes. However, a friend of mine was woken by his watch because it detected something. At emergency they discovered an issue with his rhythm and now wears a pacemaker. He’s been talking it up since. Henry: Wow. At first, wearing the watch made me very nervous. I was afraid that it would tell me something that I didn’t want to know. However, so far, so good.